The Sideline® 50-inch White Recessed Electric Fireplace offers a clean, modern look. 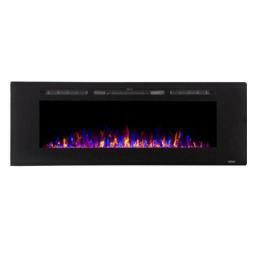 The units realistic flames, featuring two heat settings and multiple colors allow you to customize your atmosphere. More Sideline sizes and frame colors available. The Touchstone Sideline® 50 White Electric Fireplace was designed to meet the needs of contractors and do-it-yourself installers, who are looking for the beauty of a Touchstone™ fireplace mounted flush to a wall. We received so many calls from installers and contractors looking to mount our popular Ivory electric fireplace in their wall. For all its great benefits, the Ivory's top-placed heat element makes flush mounting impossible. So here you have the Sideline® 50 White, a 50" wide, electric fireplace with the same realistic flames and modern white frame of the Ivory, but with a heating element that is placed in front of the frame. The Sideline® 50 White delivers the beauty of a fireplace without the fire and smoky smell. The Sideline® 50 White has 2 heat settings (high and low), and will heat a room up to 400 sq. ft. Also, the fireplace's flame can be used without the heating feature. The Sideline® 50 White is easy to install and comes with simple and understandable instructions. 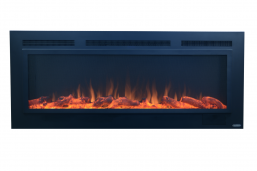 The heart of Touchstone's electric fireplaces is the flame itself. We tell our customers the flame will transcend your expectations and have not failed to impress. 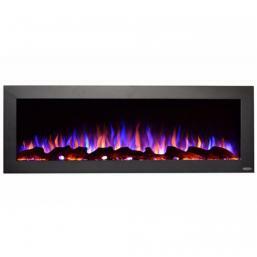 The flames deliver the same relaxing effect of real flames, without the smell or mess, and they look great in any room of the house. With the 5 settings offered by the Sideline® 50 White, ranging from a dim glow to a full fire blaze, you have the power to adjust the flame intensity based on your desired mood or lighting of the room with the control features on your unit’s remote. What makes the Sideline® 50 White unique is its heating capabilities. It allows you to recess your electric fireplace into the wall while also providing heat through the vent in the front of the unit. The Sideline® 50 White offers two heat settings which quickly add heat to a room up to 400 sq. ft. Please note the heater isn’t designed to be the primary heat source in your room or home. It's designed to warm up a cool evening or bring the temperature of a room up a few degrees. The visual appeal and heat emitted by your electric fireplace place in addition to your home’s primary heating source will provide your room with a cozy and calming aura. Your electric fireplace’s heat settings can be controlled using the remote or the controls on the front of the unit, and you also have the option of controlling the heat by setting the Sideline® 50 White has a built-in heat timer with a maximum setting of 7.5 hours. 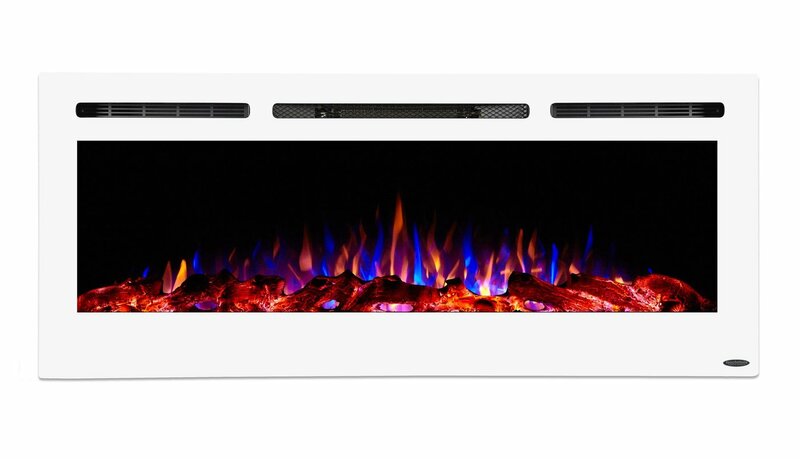 The versatile Sideline® 50 White electric fireplace offers two installation options. Although it is essentially designed for insertion in your wall, it can also be mounted on your wall. Instructions for mounting and install come with the fireplace, and we recommend you follow the simple instructions provided. We recommend placing your Sideline® 50 White at least 20” below your ceiling or 12” below your mounted flat screen TV because of its heating feature. 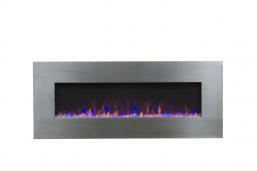 For more information regarding installation of the Sideline® Electric Fireplace.